Wgrowth in a generation. Carnival Corpo- bridge replicating the onboard version. With that, Hans Hederstrom, Managing Director give vessels. 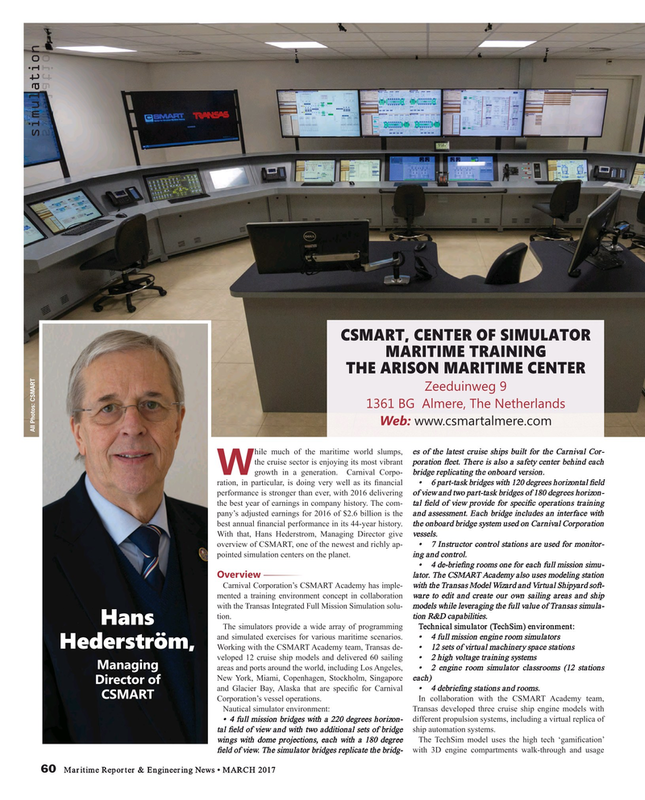 overview of CSMART, one of the newest and richly ap- • 7 Instructor control stations are used for monitor- pointed simulation centers on the planet. ing and control. Carnival Corporation’s CSMART Academy has imple- with the Transas Model Wizard and Virtual Shipyard soft- mented a training environment concept in collaboration ware to edit and create our own sailing areas and ship with the Transas Integrated Full Mission Simulation solu- models while leveraging the full value of Transas simula- tion. tion R&D capabilities. Director of and Glacier Bay, Alaska that are speci? c for Carnival • 4 debrie? ng stations and rooms. Nautical simulator environment: Transas developed three cruise ship engine models with • 4 full mission bridges with a 220 degrees horizon- different propulsion systems, including a virtual replica of tal ? eld of view and with two additional sets of bridge ship automation systems.